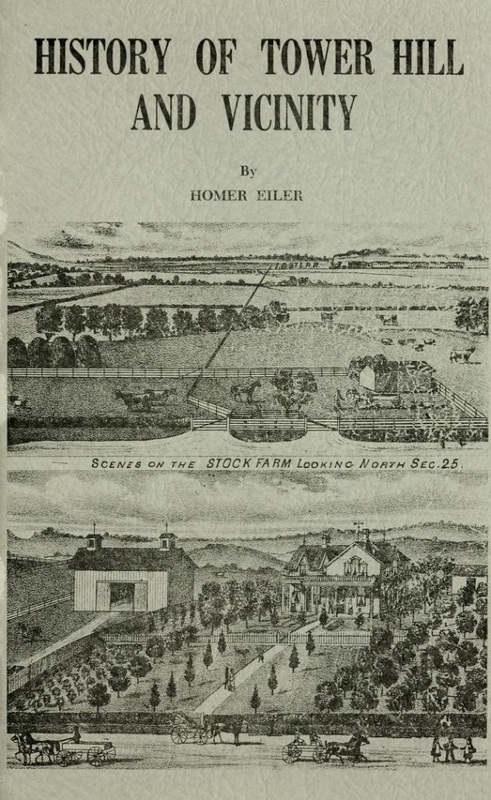 History of Tower Hill and Vicinity written by Homer Eiler, published in 1973, 92 pages. Cold Spring has the record of the first land entry in Shelby county issued to Charles Wakefield, Sr., July 19, 1821. But the coming of the railroad to Tower Hill spelt the doom of Williamsburg and all other near frontier villages, so that today they are only a memory. I have spoken of that earliest settler, the Wakefield family. Close upon their coming was Thomas Pugh with his family from Kentucky about 1820, and settled also in Cold Spring, near the Wakefield settlement. Later he removed to the Knobs vicinity, and there raised his family. The name Pugh is a household word to this day in Tower Hill and vicinity, and many descendants still live here. The Rhodes family, the Thomas Eiler family, and many who still carry the same Pugh in the male line. Jonathan C. Corley of Kentucky came about 1823 settling first at Robinson Creek, which had at that time attained quite a settlement. In fact many of the Tower Hill residents can claim that section as the first settlement of their ancestors. It is recorded that Mr. Corley was the first blacksmith in Shelby county. Levi Casey, another Kentucky pioneer, also settled in Robinson Creek about 1824. 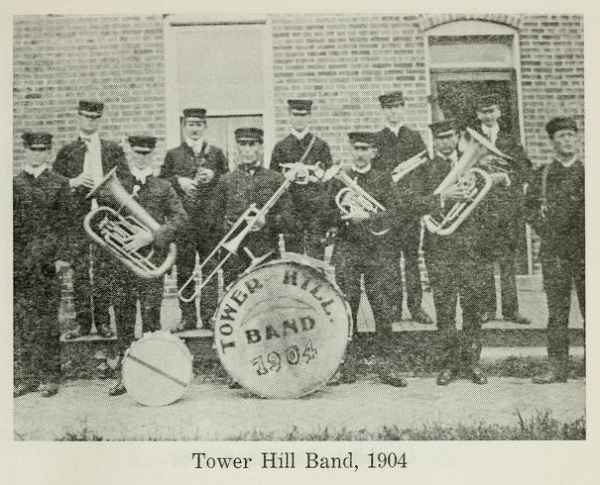 Tower Hill vicinity was largely settled by Kentucky folks. This is true of my own ancestors through the Sharrock-May line. John May, my great-grandfather, came from Prestonburg, Ky., about 1830, finally locating with his large family of ten children, about two hundred yards or more directly northwest of where Charley Smith now lives on the old Sammy Smith homestead. Here he lived for several years, but after the death of his wife and the children had married off, he went to live with his daughter Catharine, the wife of John Sharrock, where he died in 1849, and is buried in the Middlesworth graveyard, about a mile north of Tower Hill. The reader will please pardon a personal allusion, but upon a recent visit to this spot, it was easy to follow the foundation outline one hundred years ago. The rotted stumps of mulberry trees is the yard were still visible. All these spoke to me in greater volumes than words, of the children who had romped about, and especially little Catharine, who later became my Grandmother Sharrock. James Abbott, another Kentuckian, who preceded John May, was the original one to enter this old May homestead, selling out to him. The great immigration to old Shelby seems to have been in the 30's and the majority from Kentucky and Tennessee. Later in the 40's the settlers were from Ohio and the eastern states. settled in this vicinity about 1831, and our old respected Uncle Sammy Smith was a boy of about 7 years of age when his father cast his lot as a pioneer among these early settlers. A talk with Charley Smith, one of Tower Hill's most respected citizens and a descendant of this Smith family, can reveal to you the sturdy nature of these old pioneers, and the deep seated religious nature practiced in their daily walk. And how when the Sabbath day was approaching it became necessary on Saturday to make all due preparations to carry the family over the hallowed day with the least bit of labor. It was to this pioneer family a day so sacred that the utmost precaution was made to see that the family was not molested at all in their holy devotion. Peter Killam, another Kentuckian, was a settler in the Knobs region about 1830. Here is a family that for all these years have been among the respected residents of this community. Many descendants still live in the vicinity. W. W. Peek, also from Tennessee, settled near Shelbyville at first about 1834, later in Rose township. A few descendants still live near the Hill. Washbourne Wade came from Ohio about 1837 settling on the land where we recorded Westminster. He lived to a very old age. Benjamin Hobson from Ohio settled in this region. Jonathan Riley came also the same time from Ohio. Gassett Horace, also from Ohio in 1837, settled on what was later known as the Jester place. In fact he sold out to Stephen Jester about 1841. Daniel Puckett, another pioneer from Ohio about 1837 settled in the vicinity of Westminster. Most of these names are still household memories, and descendants of nearly all still live in the vicinity of the residences of their ancestors. 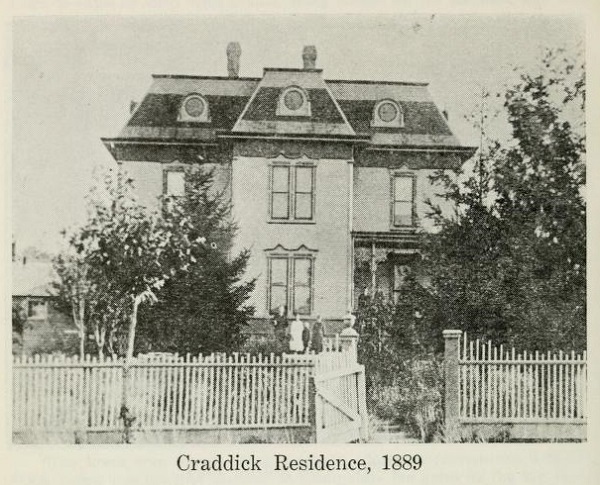 Thomas W. Craddick, a familiar name in Tower Hill during the passing generation, and specially remembered because they followed merchandising for most of their lives in this community, first settled near Robinson Creek, where it is recorded that he erected the first mill in western Shelby county. He soon removed to Westminster where we recorded he bought out the store of John Sharrock, and then to Tower Hill. Thomas Craddick was not only the first postmaster in Tower Hill, but the first justice of the peace, the first railroad agent. It was amidst such surroundings that the son Ambrose, known better by his initials as A. M., learned the merchandise game which he followed for many, many years in the Hill. In the early 70's A.M. and my father Lewis Eiler were in the general merchandise business, under the firm name of Craddick & Eiler. A. M. Craddick became one of Tower Hill's foremost citizens holding many public offices, finally becoming county treasurer. He married the daughter of another pioneer merchant, namely John Moore, of the firm of Corley & Moore. Abraham Middlesworth was another Kentucky settler but near Shelbyville at first, later living on what is now the old Middlesworth homestead about two miles north of Tower Hill. Here the son, Ner, built a substantial brick residence in the early 60's that is a credit to any community to this day- (By the way of personal mention, my father when a young man helped burn the bricks for that house.) 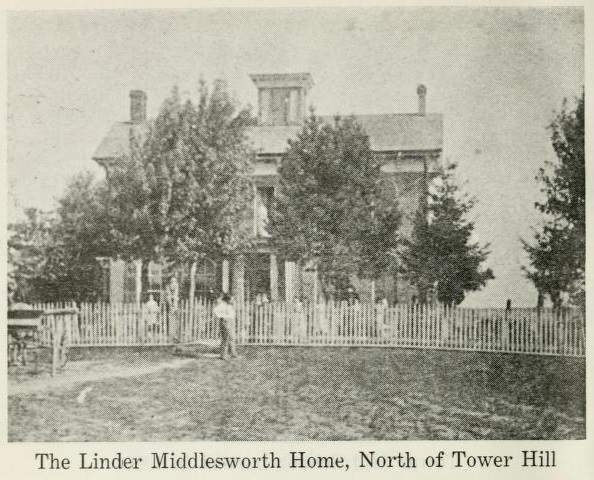 Ner Middlesworth raised a large family here, and several are yet alive and live in old Shelby. Thomas May, the son of our John May, settled in 1840 near Westminster on what is now known as the Weller place. In 1846 he sold out and removed to Oregon where he became a prominent citizen in his community. It might be of general interest to say here that the history of Oregon records our Thomas May as being among the first who set out extensive orchards in Oregon, he having purchased the sprouts in San Francisco enroute. Everard Sharrock, our great-grandfather, came from Ohio about 1832 and first settled in Christian county, but soon moved over the line into old Shelby settling on Flat Branch. We have recorded his doings at Westminster and later removing to Oregon. Conrad Hanson was an old settler coming directly from Indiana about 1832, settling just west of the John May settlement. He had a large family of twelve children who mostly settled around Tower Hill in their early married life. There are many direct descendants still living in the community. Conrad died in 1853 and is buried near John May, his brother-in-law, in the Middlesworth graveyard. The Ferryman family were very early settlers over on Mitchell Creek near Shelbyville, but later moved near the Rocky Branch region where the family grew up as part of the Tower Hill citizenry. One son born on Mitchell Creek in 1836 named J. W. Perryman is still alive, aged 90 years, and lives near Oconee. I understand he has written a book entitled, "Ninety Years in Illinois." I'll warrant it would be interesting reading. He had already published a volume of poems and early reminiscences. Conrad Eiler came to Tower Hill with the immigration from Ohio and the east that came in the 40's he coming in 1849, settling on the old Eiler homestead, new occupied by Oscar Warren. Here with the family of four boys born in Ohio, he grappled with the task of making a home, succeeding amidst all the hardships that come to all pioneers. Conrad Eiler though had a greater vision than the bounds of his own homestead, it was the interest of the community. So the Eiler Church became the great center for religious and social welfare, and to this day is a household name far and wide. With Conrad Eiler came other Ohio folks, the Warrens, Messicks, Wireys, Jesters, and others, all names being among the prominent families cf this community. And the list is lengthy, and time and space would fail me to mention them all, but these are familiar names as follows: Bonser, Metsker, Andes, Higginbotham, Brownback, Hooks, Harper, Story, Evey, Cannon, Stumpf, Morgan, Fringer, Fluckey, Scovil, Hunter, Bowman, Dutton, and scores of others. But a visit to the old time cemeteries will reveal other names whose descendants moved away years ago, or death has ended the line. It is stated here that the new Howe fighting fire equipment had recently been purchased and this was a fair lest of its ability. The next one is dated Jan. 27, 1905 starting on Sunday morning about 3 A.M. and destroyed the A. R. Robinson and Miller buildings. Another one not dated was the destruction of the Price elevator. Then later the fire on the west side, destroying the Eiler & Son building and adjacent structures. Then shortly the Gross Hotel, and in later years the Wilkinson building. So Tower Hill has been rebuilt over and again because of her many disastrous fires. Tower Hill has been very fortunate in its past history to boast of a spleen did array of medical talent, in fact, above the average for a village of this size. Unfortunately I am unable to appeal to a real pioneer who can assist me as to the early history of the physicians who were residents in the Hill even from the beginning down thru the Civil War days and into the early 70's. But probably as in all pioneer villages there were numerous so-called "country doctors" more from a neighborhood experience and a natural instinct as "good in sickness" rather than their knowledge of medical science. Then in birth cases there were women in every community who were called on to assist. In fact, women in pioneer days were almost universally demanded in this particular case of medical need, known as mid-wife. Right here I can record a bit of family knowledge that has come down in our family from authentic sources regarding the part women played in sickness in the community. I refer to my great-great grandmother, Mrs. Mary Magdalene (Wall) Hanson, the wife of our Revolutionary ancestor, John Hanson. She was born in 1765 in Virginia, and died in the "Knobs" community in 1845, and is buried in the abandoned Milldesworth cemetery, a mile and a half north of Tower Hill. Her tombstone is standing and in good state of preservation, and I would be pleased to have my friends visit the spot and place a wreath as a token of her services in pioneer days. No doubt at all but what she was present in scores of cases of births of ancestors of many citizens of our community. She was known all over this section of the country for her ability in handling very successfully all manners of ailments. I mention this particular case, because she was typical of many in pioneer days, who assisted by means of common knowledge of using "herbs" and homemade appliances, battled very successfully with all manner of ailments common to the early settler. 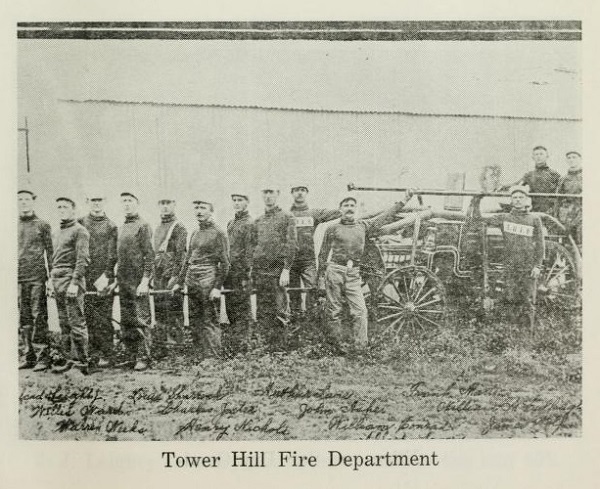 The men folk were active also in lines of service requiring more acute skill and strength, such as setting broken bones, dislocated joints, pulling teeth, bleeding a patient and other such strenuous cases as the necessity demanded. Again I call attention to another one of our family, and known by many in this community. I refer to my grandfather, John Sharrock, who came to this community in 1832 and died in this village in 1896. He was a pioneer in the early 40's with his wife (Catherine May) living on the Sharrock homestead, about a half mile due east of the Eiler cemetery in what is now a plowed field. I have in my possession an account from Headen Neil, known by many here, of the part "Uncle" John Sharrock played in the role of country doctor. He was being constantly called on to assist in setting broken bones, dislocated joints, and pulling teeth, and bleeding folks. Only recently it was my privilege to see the forceps he used in this pioneer dentistry. They sure are cruel looking instruments, not so much in the pulling process but a twisting affair that certainly was very painful, bordering on torture. It is recorded in our family that he would be called at all hours of day and night in the midst: of his daily work, but never too busy to lend aid to to one in distress. I refer particularly to broken bones and such surgical work that required strength and nerve. Even at the noon meal time a rider would come galloping into the yard urging immediate help, a as neighbor had met the misfortune in breaking an arm or leg or something else as serious. Throwing a sheepskin over his favorite traveling horse, perhaps bare-headed and coatless, he rode at breakneck speed to the neighbor needing immediate assistance. From his pioneer experience and unspeakable nerve in handling these extreme surgical cases, being taught from his childhood how to handle these serious mishaps, he became skilled in this activity of needed assistance. Never receiving any "pay" as it was the pioneer custom for everyone to assist the community in any manner where help was needed. If anything approached to payment, it was rendered by lending assistance at hog-killing times, or rail splitting, or some farm task. So this is a partial picture of early days around Tower Hill before the advent of the "Diploma Graduate" physician. The average pioneer community were slow in admitting the "newcomer" with his sheepskin guaranteed knowledge of all the ailments the human body was subject, and the university remedies recommended for a cure. This primitive description of the old-fashioned country doctor brings us down to the period of the Civil War and the 70's. And here your writer can stretch his memory to around the days of 1876. My first dim recollection is of one whom I now look back and see bridged the gap so to speak of the days of great-great-grandfather Hanson and Grandfather Sharrock to the sheepskin graduate of medical science. I refer to that old pioneer family doctor, of the early days of Tower Hill, Doctor Brown, the father of the Brown family so well known even in this generation, namely — Cass, John, Clark, Lucy, Mae and Ollie. He was our family doctor, and honestly I feel I owe my life to his natural skill and nursing me in a serious ailment, it being a relapse of that dreaded child disease, the measles. I have often heard my dear mother tell the story when I was so low when even Dr. Brown led my mother from the sick room, saying, "Julia you had better retire, for it will all be over in a few minutes." But she said "Doc Brown never left me a minute," working alone with all his natural skill to thwart a fatality. And he won. I mention this because Dr. Brown even with only one leg, was of that old type, using a common sense diagnosis of the cause of the ailment, and applying home made remedies to a miraculous success. Ke had if any, only a limited college medical education. Along at this same period Tower Hill had 2 other physicians who were of the university type, namely Dr. Fringer and Dr. Morgan. And they soon wove their medical personalities into the favor of the community, so the days of the old fashioned doctor was past. Dr. Morgan later gave up the practice and engaged in the drug store business. I remember so distinctly that old drug store, because at Christmas times it was the only place where toys and candies were kept. Soon another college doctor hung out his shingle in the Hill, a Dr. Hunt — and I expect almost forgotten by the few old timers. Dr. Hunt was a scholar and educator, taking a keen interest in the public school system, being a member of the school board, and by his interest assisted greatly in making the schools of that day well spoken of as to organization and high grade teachers. Just as a proof take a glance of these names who even today are recognized as examples not even excelled to this period. Professors— W. G. Kelley (late Judge Kelley of Shelbyville). Wash Rarer (Uncle, I think of Emma Freeze), T. C. Eiler, Cass Brown, Frances Baines, I. L. Brant afterwards a prominent doctor in the Hill), C. O. Bennett (afterwards a prominent physician in Missouri), and so on. Dr. Hunt was here only a short time, removing about 1880 to Warsaw, Ill. Dr. Fringer was a resident for many years — and remembered by many old timers. Dr. Morgan after his wife's death sold his drug store to Dr. Fringer, and with his daughter, Anna, removed to Denver, where he died only a few years ago. Then came Dr. Shelton from the south and spent the remainder of his life here. He was a well respected citizen, and his family entered into the life of the community in an affectionate manner. Then was added another doctor who endeared himself to the community — not only from his medical experience but his interest in music. His life in our midst needs no comment as well know by this generation. Up to about the year 1937 he is the only living doctor of our past medical history. I refer to Dr. Young. During this period of the late 80's there entered another university graduate and with his many years of university experience he possessed what is considered the greatest asset any physician can possess, that is a natural instinct for diagnosing a sickness. I refer to my dearly beloved uncle. Dr. I. L. Brant. He first settled in Lakewood, but soon felt the Hill offered a more lucrative practice and a broader field of activity. It is common knowledge that he was the most successful doctor in all manners of sickness that ever lived in our community. But his life was cut short by an early demise in 1897. Ed writes me that the 90's recorded in addition to Doctors Brant and Shelton, Dr. A. J. Humphrey, Dr. Frank Martin, a Tower Hill boy, so well known and who married one of our home town girls, namely Miss Ollie McCullough. As we all know Dr. Martin passed away only a few years ago in Pana where he had removed and built up very lucrative practice. Then another boy of the community hung out his shingle in our midst, Dr. Homer Corley, who still resides in the village. Homer belongs to that old pioneer family of Corleys who are connected not only with early pioneer life but in the mercantile business and preaching profession as well. From the period of 1900 to the present there has appeared other doctors, as Dr. E. A. Dowell, and Dr. A. J. Hitt. I am informed that Doctors Corley and Hitt are the present physicians in the village. Two other doctors in dentistry are recorded as practicing their profession at different periods since 1900, namely Dr. E. B. Strange, who married Miss Floy Cannon of that old time respected family. Then Dr. John W. Green of the same profession, who resided here from 1914 to 1926 and who also married another of our home grown girls, namely Miss Ruth Foor. And thus ends our record of the medical fraternity. 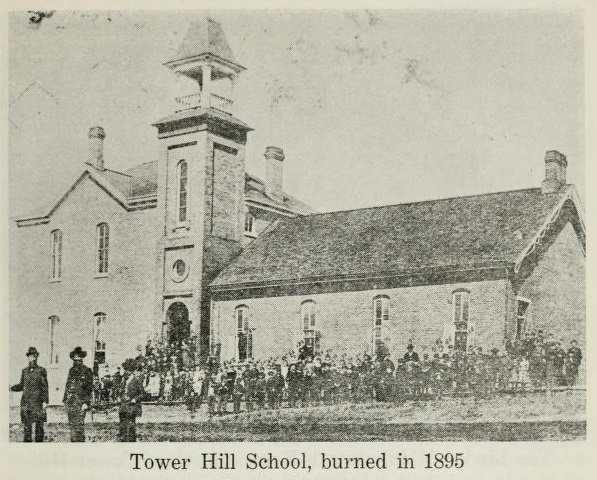 Rightly belonging as part of the history of Tower Hill is the so-called "graduating class" of 1887 from the Tower Hill grade schools, said class being ever afterwards known as the "Class of '87." It is one of the most remarkable items of interest that belongs to the archives, that after 50 years the same self-appointed historian of the class (Homer Eiler) is able to record the history of almost every one of that class of 17 boys and 13 girls to the present time (1937). It was in the spring of 1887 when this "A" class, as we were called in the grade schools of that day, completed the course of study, and many took the county examination for teachers, all passing and entering the teaching fraternity. In a year or so, we each found our real places in life, changing to vocations more suitable to our liking and the economical conditions, with a record of their different pursuits worthy of emulation. I not the summary gives at that time, 20 teachers (some part-time), 2 ministers, 3 stenographers, 3 merchants, 5 music teachers, 17 who attended college, 16 married and 2 deaths. It was 30 years until I wrote the next write-up of the class, and find only 3 more had passed to that Beyond. The memorial list then was: Nora Brown, Belle Warren, Homer Fairchilds, John Pfeiffer and Sattie McDermoth. To the present time we can add the following: Ed F. Karls, Howard Fleming, Maude (Tilley) Elliott, Madgie (Batey) Miller, Mary Leighty, Charles Faught, William J. Richardson, and Frank Rhodes. I am unable to give a definite record on the following: Riley Middleton, Thomas Inman and David Ashe. But a remarkable record to know that after a half century there are 14 yet alive. They are scattered far and wide, and I suspect the writer lives the farthest of any, but my interest in that class has followed me all these 50 years and would unto the ends of the earth. Briefly I will now give a record of the class, and trust that there may be many exchanges of letters, renewing old-time class friendships. ELLA LEIGHTY. Of all these 30 classmates, she is the only one who has continued her residence for all these 50 years in the old home town. Her only vocation in life was leaching, retiring many years ago. Living a life of single blessedness, she now resides in the old family household, looking down the vista of the future, toward another home in the Beyond, into which she will graduate from this earthly class into one of eternal assurance of a well spent life. MARY LEIGHTY. A sister of Ella's, also followed teaching for several years, then entered the mercantile vocation in Chicago, serving with several of the world's largest institutions. Mary never married, and always called Tower Hill her home. But how sad to relate the record of her untimely death in the fall of 1933 when she met a fatal auto accident, and is buried in the home cemetery. MAUDE (Tilley) ELLIOTT. Another one who followed teaching and lived for many years in the village, a leader in the Presbyterian church. She was married to Rev. Elliott, a Presbyterian minister, and they made their home in various parts of the country. It was while residing in Medford, New Jersey, that Maude met her untimely death in an auto collision, leaving the husband and 2 well-educated children. ELLA (Cannon) SMITH. Ella followed the musical career, until matrimony gave her a calling to a household of her own. She was married to Ed Smith, but sad to relate after a few years she was left a widow with a family to look after and train for useful vocations of life. Happily she has seen this accomplished alter much sacrifice and careful planning. Ella now resides in Kansas City, Mo., and would be pleased to hear from her old classmates. EMMA (Metsker) KARLS. Another of Shelby county's teachers, which profession she followed for several years. 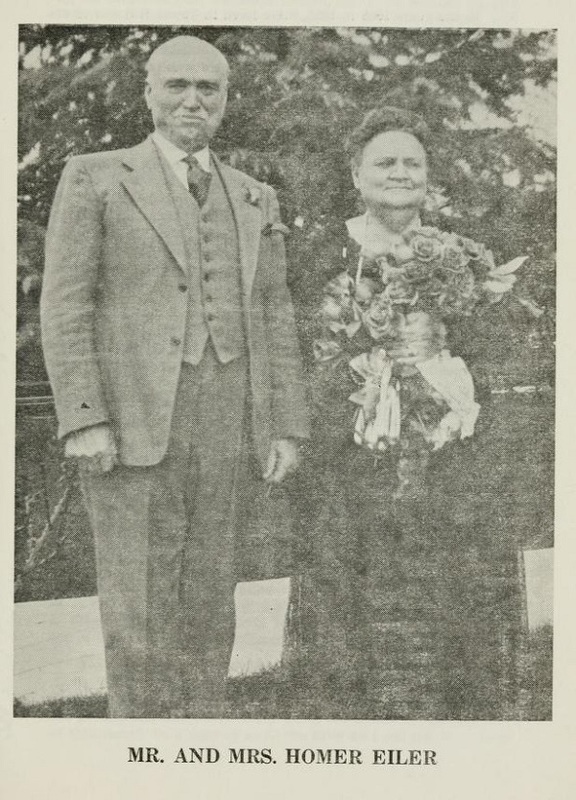 Emma was married to her classmate, Ed F. Karls. They finally settled in southwestern Missouri, where 2 sad memories will forever follow her, one the losing of her dear husband, and the other — a Gold Star Mother sacrifice of a son in the World War. Emma now resides in Columbia, Missouri, Route 5. STELLA (Weeks) HUNTER. I see the write-up of 1894 states Stella also followed teaching, even to Nebraska, but later yield to yearning for home, returned to the parental roof. But the matrimonial "bug" buzzed once too often and 'twas no more Miss Stella, but Mrs. M. Hunter of Cowden, 111. But the sad hand of fate entered the home of Mr. Hunter, the husband-father, was no more of the family circle. Stella was a widow with 2 children, who have made splendid records in vocations to their liking, while mother still lives at the old home in Cowden. LORA (Fuget) NAZOR. One of our number who chose music as a vocation, and has been very much interested in the same down to the present, and for her love for music has a musical family. Lora has been a widow for many years, and now lives in Memphis, Tenn., at 1898 Madison Avenue. MINNIE (Fuget) FESTON. While musically inclined, Minnie chose a home life, and was wedded to a Tower Hill boy, Mike Fenton. They have one child, a son, who lives in Chicago, while their home is in Carlinville, Ill., at 617 Summer Street. EFFIE (Fringer) OWEN. Unfortunately not much of a record for the daughter of one of Tower Hill's most popular physicians, of the '80s and early '90s. We are informed she married a Mr. Owen, at one time the agent of the B & O railroad at the Hill. She now lives at Olney, Ill., 218 South Morgan Street. SATTIE (McDermith) STOCKWELL. Removed to Kansas, where she was married and lived the farming life. Later moved to Los Angeles, where as a widow she lived until 192G, when she too passed away. We have visited her last residence at 510 East 47th Street, Los Angeles, where a sister and other members of the family still reside. NORA BROWNE. Very soon after the class had finished the term of school, we were shocked at the early passing of a popular member of the class. Fifty years hove rolled by but her memory still lingers. She was the daughter of Dr. Brown, one of the Hill's earliest physicians, and whom we have spoken of in glowing terms in our chapter of physicians. BELLE WARREN. Not far apart was the passing of the second member of the class. Miss Belle was the sister of Miss Nora Warren of Tower Hill at the present writing. The Warren family were among the earliest pioneers in the community, coming in 1849 with the Eilers, Brownbacks, and others. HOMER FAIRCHILDS- In my former write-up I spoke of the thoroughness of Homer as a student. He followed teaching for a while, later resided in Chicago, where he studied law having a successful career. He is numbered with those who have passed away— dying in Greenville, HI-, in 1920. ED F. KARLS. Ed followed teaching for some time, later took the civil service examinations, securing a position as postal clerk on the R. R. Later changed to farming, and as slated married Emma Metsker, and in after years settled in Jasper county, Mo., where he passed away in 1925. FRANK RHODES. Frank has had a varied career, attended a business college but only active a short while, spent most of his life on the farm. Married and resided on the Robert Pugh homestead, and passed away in 1936. I. N. FLUCKEY. Followed teaching for a while, but fitted himself for office work, finally securing a position in the U. S. Treasury at Washington, D.C, where he has spent these many, many years. Married there, raised a family but a year or so ago lost his wife, a very talented lady. Personally speaking, it was our pleasure many years ago to visit Newt in his home. Only the passing years have made any change, yet the same old time friend as ever! CHARLES C. O'FARRELL. This name will at once be recognized, as Charles is the brother of Miss Mae O'Farrell of the village. Sorry to report that a letter received a year or so ago from Charles painted a sad picture, because of failing health and a great financial loss in all his business under, takings. His P.O. address is General Delivery. Kansas City, Mo. WILLIAM J. RICHARDSON. One of the very few who lived in Tower Hill, or Shelbyville, all these 50 years, until death claimed him in 1935. 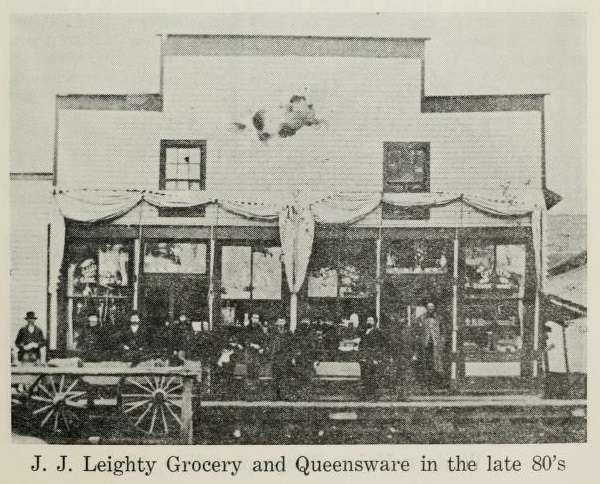 Will taught for short time, then entered business in the village, later in the real estate business in Shelbyville, where he made quite a property accumulation. He leaves a wife and family, and host of friends. GEORGE LEIGHTY. A member of course of the old pioneer Leighty family, and of the same calibre that has marked success in all their undertakings. George left for Phillips, Wis., many, many years ago, engaging in the railroad business, where he was agent for years, finally retiring. He is married and has a family living in that city. RILEY MIDDLETON. Here is one of our classmates marked "LOST" since the first write-up in 1894, and the present whereabouts still unknown. he was a general traveling salesman for ready-to-wear apparel, and died very suddenly in Tulsa, Okla., in Dec. 1930, and was bur5ed in Tower Hill cemetery. Left a wife and a son. (Rev.) JAMES S. TOLLEY. One of the Knobs students, who finished the common grades in the Hill. Took up preparation in several universities for the ministry, which he has followed all this half century with wonderful success. Only a few years ago we had the pleasure of entertaining him and wife in our Topeka home. His last address was Hillsdale, Michigan. (Dr.) WALTER L. NEIL. I am proud to claim Walter as my chum and seatmate during cur "finishing" up period in the Grade schools of T. H. Followed teaching for several years, later trained for the dental profession, which he followed the rest of his life in Deadwcod, South Dakota, where he married a Tower Hill girl, Josie Peek (sister of May). Was saddened a few years ago by her demise. Walter retired from his chosen profession few years ago, and is now living near his children in Rapid City, South Dakota. Had the pleasure of entertaining him and his son and family, only this last fall. Certainly a wonderful meeting after all these eventful years. CHARLES A. FAUGHT. 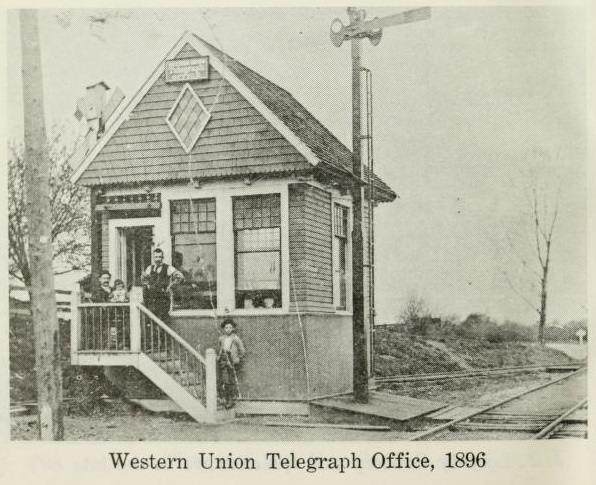 Another record for the teaching profession, but for short time only, as entered the railroad business, but later gave that up for an office position in Decatur, where he married and continued to reside until his death n 1934. Another one in our Memorial list. JOHN D. PFEIFFER. One among the first to answer to that final roll call after a short period in teaching near Cowden. He is a brother to our old time friend, and so well known by all present citizens, namely Mrs. Mattie Leighty. DAVID ASHE. Unfortunately cannot give any record of late years, not even knowing if dead or alive. Followed teaching I know soon after the class separated in 1887. Also that he always lived in and around the Hill. TOM INMAN. Will confess to my inability to add anything to these later years, in fact, have no knowledge of his present whereabouts. Sorry. The first part of his life was given to teaching, and he was principal of Cowden schools. (Rev.) JOHN BRANDON. I certainly was pleased to receive within the last year a letter from my old schoolmate of the early '80's in Frog Pond, and later of the class of '87. John followed teaching and the ministry for many years. His present address is Owaneco. HOMER EILER. I hesitate to start, as wanting to make it brief, for career has been scattered over several states. 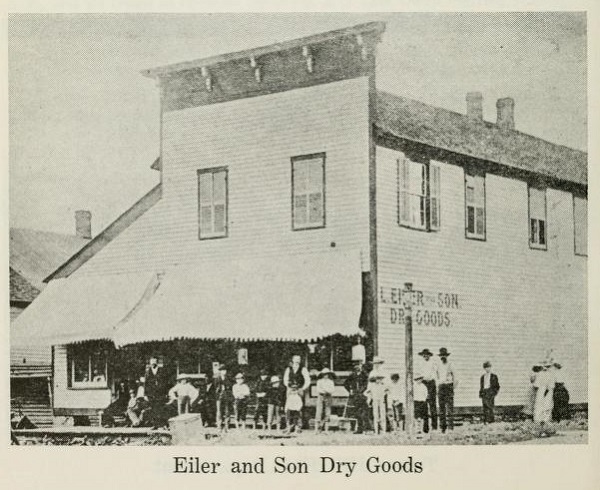 Entered DePauw university, later in a Kansas Normal school, health failing entered a business career, starting with father as L. Eiler & Son, in the Hill. Have followed a line of business rest of my active life, retiring few years ago, and hiking to California, as the saying goes to the "Old Folks Home," meaning Sunny California — the play- ground of America, and it surely is. Married in 1891 — we have our daughter near and 2 grandchildren. Have made a hobby of writing, since retiring, on various subjects, but have specialized in Genealogy, having written 17 family histories. Besides contributing to the paper of the Old Home Town for many years, subjects of a reminiscent nature, knowing our old time friends are interested in the events and happenings of the long ago. Somehow when we recall all these and the folks connected with them, our friendship is renewed, even lo a reverence. With this in all probability my last write-up of our class of '87, I tender to you each the friendship and esteem that started fifty years ago and has continued to this present time, ripening toward that Class of Eternity, where Life really begins. Good Bye. Homer.